Tomorrow is St. Patrick’s Day. As is the tradition of Nissa and I, we will be having breakfast at Bull Feeney’s tomorrow morning. They serve a fine full Irish breakfast, and the large pours of beer taste even better when consumed before noon. Nissa will have to head to work, whereas I have a few hours in the Old Port before I must go pick up Emmett. I’ll probably check out the new porter that will be poured at Gritty’s, or go get a pint of the recently rereleased Bourbon Barrel Aged Lake Trout Stout at Sebago. Normally I finish up with a chalice or two at Novare, but day care is closing at 3 tomorrow, so I’ll have to skip the bier garden this year. To get myself in the mood, I’m enjoying a few stouts tonight. First up is the classic Cadillac Mountain Stout from Bar Harbor Brewing Company. If I review any others tonight, I’ll add them to this post. Poured from a cellared bottle into my Beamish Imperial Pint. This bottle has been in my cellar since May 2009. Caddy is a very dark beer. The opaque black liquid fills my glass. The head is foamy, brown and thick. As it settles good lacing is left behind. A little bit of film and foam coats the sides of the glass as I swirl the beer about. Sweet roasted malts greet my nose as I inhale this beer’s aroma. Milk chocolate covered caramel comes to mind. Dark malts with a slight roasted quality is the first thing I taste as the beer enters my mouth. As I swallow, the taste of hot fudge syrup is present, but it is only the slightest bit sweet and not syrupy at all. I’m not sure if that quite makes sense; it is chocolately, but not like normal chocolate, hot fudge sauce is the closest thing that I can think of to describe it. There is a sherry-like quality to the beer, but it isn’t too strong. The carbonation level isn’t very high, but there are still some bubbles to this beer. A coat remains after I swallow, although it is a bit watery and not too flavorful. There is just enough of the beer in it to make me want another sip. Overall, I am a fan of this stout. This aged bottle doesn’t quite live up to the once legendary status of this beer. I would drink it again, most likely fresh and certainly nothing older than a year old. I had samples fresh at the brewery, and I remember liking it more, but the time and place could have been a factor in that memory. People will tell you that the beer isn’t as good as it used to be, before the brewery changed hands and (supposedly) the recipe changed. I can’t really comment on that, as I wasn’t much of a beer geek back when I had the original recipe and I don’t remember how it tasted. Still, it is a very good stout that is worth seeking out. 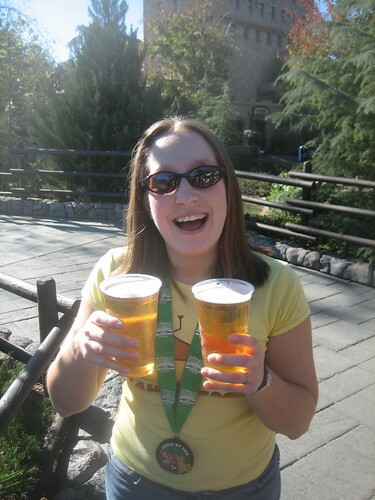 And she was this excited about Canadian Beer! It probably also had something to do with wearing a t-shirt with a hot dog on it. Nissa and I bought ourselves a Wii yesterday. No games other than Wii Sports so far, but expect Mario Kart and Smash Brothers to be purchased soon. Just got back from the soft opening… A great draft selection, about 20 or so beers, no locals, closest is a Suttynose. They have Beamish! The bottle menu is about 5 pages long, divided up by style. There is a limited menu of plates of appetizers…no hot wings or anything like that, more like cheese plates and tasty olives. The staff is new to the bar scene (it seems)…my pal Jeff ordered a $5 beer, paid with a $20, and got a $5 and $10 bill as change; he wasn’t able to leave a tip since he didn’t have anything small. Overheard friends of the bar who claimed the problems with the taps were due to the person who ran the keg lines doing a bad job. A shout out to my friends at the Maine Beer Writers Guild: I overheard a few people who, like me, learned of the early opening through your blogs. Thanks for keeping us all informed! So far the second room and outdoor seating aren’t licensed, but should be open by next week. Everyone was very friendly. The owner gave a little speech at one point, telling everyone that it was his and his wife’s dream to open a place like this. To make up for the taps pouring poorly and the staff not being quite prepared to handle all of the customers, he bought a round for the house. It was quite generous. Overall, I’m not going to say it’s my new favorite Portland bar, but it is very nice, certainly in the top 3, and has strong potential to become number 1, once the few problems are sorted out. I’ll be back tomorrow so Nissa can try it out, and I expect to be back numerous times this summer. I’m very sure this is the first bar I’ve been to where there isn’t a single beer available I wouldn’t consider drinking. Congratulations Novare Res. Here’s to a long and successful run! Nissa and I have signed a buyers’ representation agreement with a Realtor and spent a couple hours in Brunswick this afternoon looking at four homes. The four properties appeared good on paper, but only one of the four would we consider living in. We’re not about to make an offer on it or anything; we’re also looking in South Portland and Westbrook and want to see what’s out there. It is reassuring to view a home that we could see ourselves in for the next few years. The Raltor will keep us updated on any Brunswick properties that come onto the market and fit our budget, plus go over what’s available in South Portland and Westbrook and e-mail us with some listings. From there, Nissa and I will plan another trip to visit some potential purchases. Nissa and I have been discussing buying a home for a long time. We’re now going ahead and hope to have a place of our own by the summer. In the first two weeks of February we attended a first-time home buyers course offered through hoMEworks. This past Saturday we met with a representative from my credit union, who referred us to a local mortgage company that they arrange their home loans though. We have an appointment with the lender on Friday morning. Since it is wise to shop around for the best deal (which isn’t necessarily the lowest interest rate), we also have an appointment with a lender from Nissa’s credit union on Saturday morning. We are hoping to get a loan that will cover the kind of house we can both be happy with. Each of us has good credit, but also a bit of debt in the form of auto and student loans. I think we are being reasonable with our home buying expectations. We certainly aren’t going to look for who will loan us the most money and then buy as much as we possibly can. We’ve determined how much money we’d like to spend each month on the house (the mortgage, home insurance, heat and taxes) and we’ll find a home that fits that budget. I’m quite confident that the amount we will qualify for will more than cover the amount we are willing to spend on a house. Being a first time home buyer isn’t easy, but luckily there is a lot of great information out there. The home buyers course I linked to above offered a wealth of information, as well as some contacts in the banking/real estate/title law fields. The Maine State Housing Authority page has a lot of information for first time home buyers as well. I’ve begun to read the Get Rich Slowly blog for economic advice that goes beyond the home buying process. There is also good advice available the The Motley Fool. Lastly, we’ve had some fun looking at what homes are available through Realtor.com and Zillow.com.